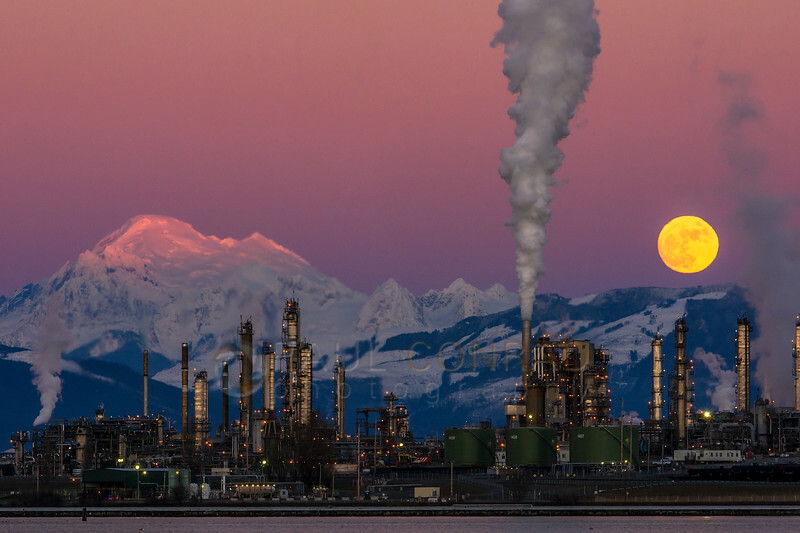 On Wednesday even Jan. 22, 2017, I spent the evening photographing the full Wolf Moon as it rose over the Tesoro Refinery and Mount Baker. Three years ago, I photographed the Tesoro Refinery for the Houston Chronicle when the U.S. Chemical Safety Board released its final investigation report and suggestions for improvement. 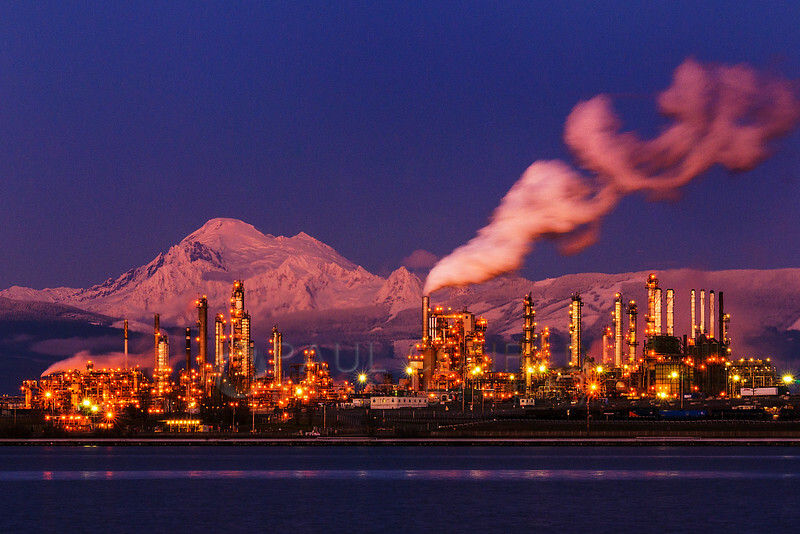 The photo was pure luck as it was super cloudy earlier in the day when I was shooting the refinery at the Fidalgo Bay RV Resort from across Fidalgo Bay. 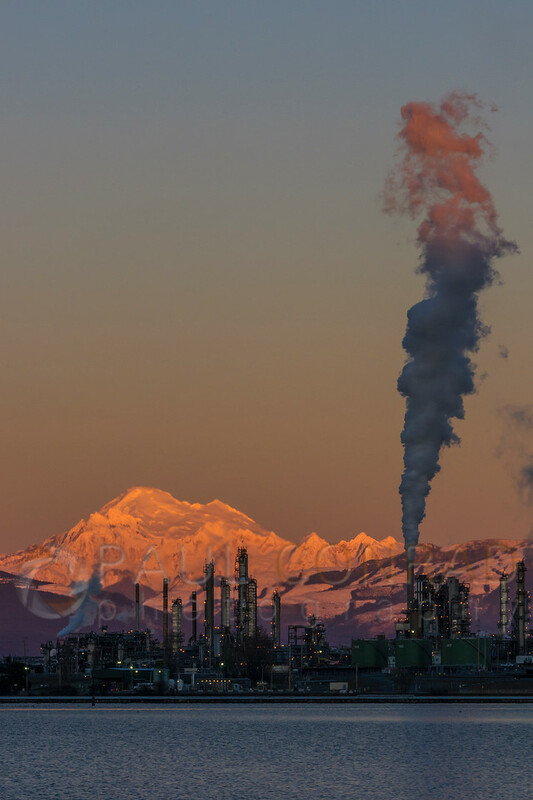 You could see Mount Baker, but it was capped by clouds. However, during a ferry ride from Guemes Island I noticed how clear it was east and how the clouds dispersed out west. My creative juices were roiling!!! Once off the ferry, I raced back to that same spot. While driving, the color was turning a deep red. I arrived about 20 minutes before sunset. I continued to shoot at eat an hour after the light was gone. The result is the photo above and since then, I’ve been dying to get something similar with a full Moon rising above it. Wednesday was my chance. Reading the week’s weather, it was to be clear on Wednesday the 11th of January. I then opened these applications on my phone: The Photographers Ephemeris, Lunfaqt, and MoonTrajectory. The most important information that popped out at me was that the Moon was to rise 20 minutes BEFORE the sunset. I then checked TPE for the direction of moonrise and marked best possible locations to get the refinery and Moon rising. The morning before I made sure I had all my batteries charged, all lenses clean, my headlamp packed, and set out warm clothes including gloves, scarf, windproof jacket, and winter shirt. It’s been freaking cold around here the past month or so. Being from Colorado, I learned to shoot in snow and cold the hard way. Frozen fingertips freaking hurt!!! For the Best Exposure: The Moon should rise before the Sun sets by least 20 minutes to 40 minutes. This allows for the Moon to rise above the mountains plus the exposure balance between the Moon and landscape is not too drastic. Pre plan your destination and arrive at least an hour or more early. Moon and Sun rise and set times are when the disk dips below the horizon, not the local terrain. It may take 20 minutes for the Moon to rise over area terrain. Expose for the Moon. Take a spot meter reading of the Moon then add 1 to 2 stops of exposure. You’ll still get shadow detail and can pull it out with Photoshop or Lightroom. Use manual exposure. Manually set your shutter speed and aperture. Auto exposure tends to overexpose the scene. Yes, it’s OK to chimp while shooting. Your ambient light will diminish as the Sun sets causing you to have longer shutter speeds, but the Moon will actually begin to brighten some as it rises in the sky. Remember: As your shutter speed lengthens, the Moon will “drag” through the frame. Keep shutter reasonably short: less than 4 seconds. Use manual focus. Using autofocus to fine tune is great, but don’t let the camera choose the focal point. I always focus on the mountain or my subject. As it’s near infinity, the Moon will also be in focus. Use manual white balance. Auto white balance will try to negate the reds and oranges out of the scene. Start with “Daylight” then move to “Shadow” after the Sun has set. Use a low ISO. Yes our cameras can shoot great at ISO twenty billion, but using the lowest ISO for the best use of your sensor. You will be on a tripod after all so take advantage. Put your camera on a sturdy tripod and use a cable release with the Self-Timer and “Exposure Delay Mode.” A cable release lets you start the timer without disturbing the camera. Then the self-timer let’s any vibrations dampen, while the “Exposure Delay Mode” brings the mirror (if you don’t use a mirrorless camera) up and gives a short time for the vibrations to settle before opening the shutter. These help you keep your picture sharp. Shoot in raw. Might as well use the power of the raw file to get a better image. Why let the camera figure out all the setting and write a file that most probably will need work? And most importantly: Have Fun!!! 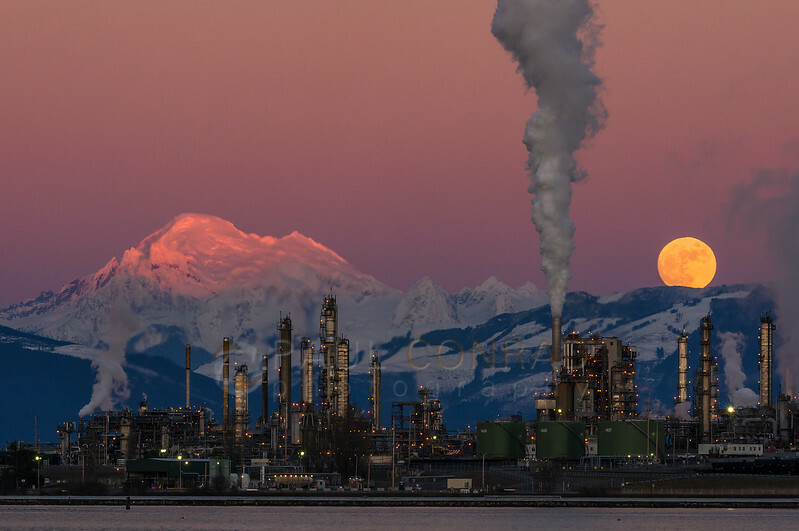 After getting the shots with the refinery, I drove north to get a shot of just Mount Baker and the Moon. With the rays reflected in Fidalgo Bay, I spent another 15 minutes getting some nice shots. Paper, metal, and canvas prints are available for purchase. 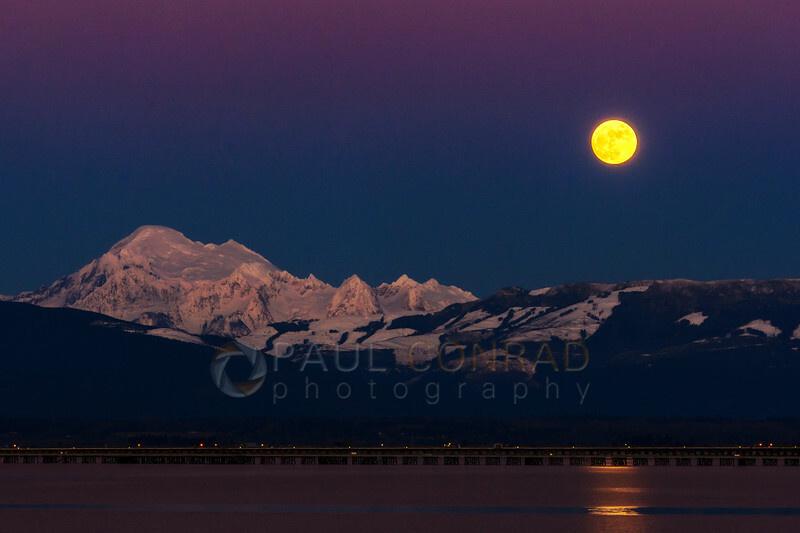 Visit the gallery Landscapes of the Great Pacific Northwest to order. Thanks for this post/tutorial. You got an absolutely amazing moon shot. Congrats! You’re welcome K’lee. And thank you for the compliment. The photos are the result of proper planning and time management. Just remember the tips to elevate your photos to the next level!! !